Styx, sarcastic, cunning and cynical to the horror, completely befits his family - he is a goblin not only in body but also in spirit. Without remorse, he steals the last pennies from starving vagabonds, with an appetite cuts everyone in his path and dreams only of unheard-of riches. Endless self-interest leads him to the ancient abode of Korangar, where on the eve the dark elves made an indestructible alliance with the dwarves and initiated a real genocide against the goblins after their participation in the fall of the Akenas Tower, which was observed in the final of the previous game - Styx: Master of Shadows. 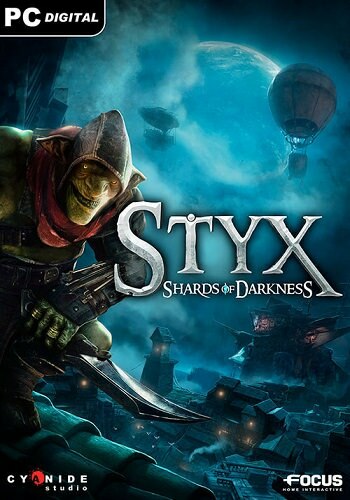 Without thinking twice, Styx intends to destroy the threat looming over his people ..
Styx: Shards of Darkness - this is a sequel to Styx: Master of Shadows, where players are waiting for new enemies and locations, as well as the mass of all sorts of gameplay innovations. The second part offers unprecedented freedom of movement, sophisticated mechanics of stealth and quiet killings, greatly improving and expanding the strengths of Styx: Master of Shadows. Explore and explore the vast open spaces, slip past enemies and bosses or destroy them, and experiment with new abilities and weapons in the arsenal of our goblin killer. Play solo or with a friend. Climb into the dizzy city of the elves, infiltrate the dangerous territory of the dwarves and visit the unknown lands full of deadly dangers - the fate of your entire species depends on the fulfillment of your assignment. You are waiting for multi-layer sandboxes, animated with the help of the graphics engine Unreal Engine 4. Hide in dark corners or climb higher to remain unnoticed. Spend experience points on new skills. Explore the world and get valuable artifacts, collect ingredients and create dangerous traps and other useful items, create your clones to distract and deceive the diverse enemies on your way! Developer logo cut | Nothing is recoded.